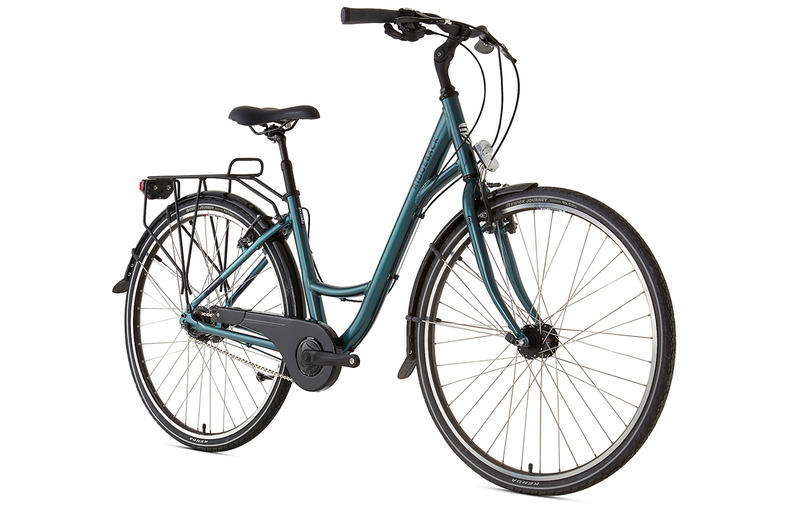 Have you found the Ridgeback Comet Womens Open Frame City Bike 2020 - Green Cheaper? Beeline: The Ridgeback Comet Open Frame is a Women’s city bike, featuring an open frame for ease of getting on and off the bike, made from aluminium and finished in a great looking gloss green. The single chainring reduces maintenance, with 7 gears on the rear operated by a Shimano Tourney gripshift. The 11-32 cassette provides a wide range of gears, enabling you to get up Headington Hill should your commute take you that way. Promax V-Brakes offer powerful braking for the trip back down. Ridgeback: The Comet is built around a confidence inspiring 6061 heat treated aluminium frame and a chromoly fork to give you a stable and comfortable ride. It has been finished with a single chainring up front to keep maintenance low and a high-quality Shimano 7 speed 11-32 cassette to still offer a gear range that will allow you to take on any terrain. stopping is taken care of by Promax V-Brakes front and rear to make the Comet a fantastic all-round urban bike. City and hybrid bikes cover a multitude of bikes and uses whether it’s getting to and from work, around the city, exploring paths and trails or going out for a ride on a Sunday. The type of riding you are doing will determine which is the best bike for you. City Bikes are designed for use in and around the city and are ideal for commuting. These bikes sit the rider in a more upright position for greater ride comfort. Frames are made from aluminium with a hi-tensile steel fork, or on more expensive models a carbon bike. For women there is an added option of whether to get a step through frame, for ease getting on and off the bike, although the step through frame sacrifices a bit of strength and rigidity compared to the normal frame. The gearing on these bikes start use 7,8 and 9 speed shifting with 3 chainrings for a range of 21-27 gears. Hybrid Bikes – Are a combination of road and mountain bikes, using road bike wheel size (700c), but with wider tyres and the robustness of a mountain bike with a suspension fork. The suspension fork delivers a smoother ride, and many come with a lockout feature for it to behave like a rigid fork, but they do add weight to the bike. The gearing on these bikes start use 7,8 and 9 speed shifting with3 chainrings for a range of 21-27 gears. Flat Bar Road Bikes – Are great for longer commutes or for fitness and leisure riding. These generally use lighter weight frames and sometime more performance based geometry, but not as aggressive as a road bike. These bikes are often equipped with a carbon fork for greater ride comfort and reduced weight, technology used on most road bikes. On some of the higher models the gearing is copied from road bikes too, with two chainrings on the front for improved pedalling efficiency and 9 or 10 on the rear for a wide range of 18/20 gears. The riders position on these bikes will be less relaxed than on the city bikes or hybrids in order to go faster, whilst not being as stretched out or aggressive as on a road bike. What do you think of Ridgeback Comet Womens Open Frame City Bike 2020 - Green?